Getting prepared to start removing both of the walls pictured here. The living room/kitchen wall and kitchen/dining room wall must go to make the push out into the living room area so we can enlarge the kitchen. Our youngest son helps in the destruction process, every little boy’s dream! After stripping out the old cabinets and wall board we are now able to see our new space for the first time. 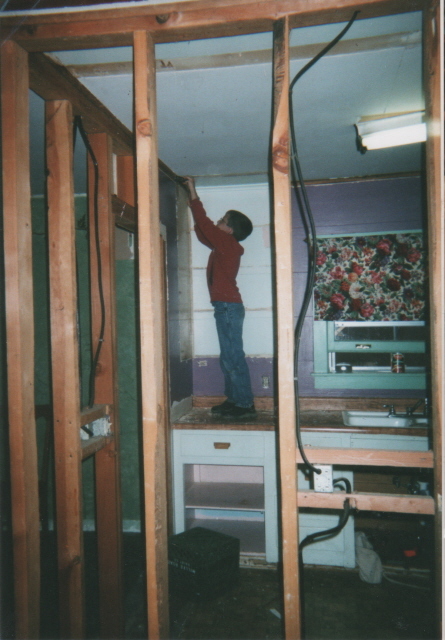 Now we are faced with taking out one bearing wall and one non-bearing wall. 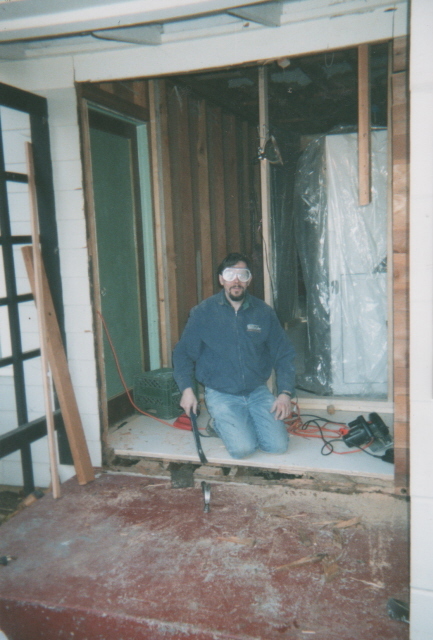 The non-bearing wall is simple: you can just cut your studs in half with a reciprocating saw and pull them out. Removing a bearing wall (usually runs at 90 deg. to ceiling joists) is more difficult as a temporary wall must be built to bear the weight of the house until a beam can be put in it’s place. ( check last weeks blog on details for building a temporary support wall.) You will need to do this according to code in your area. Once the walls are down and Beam is in place, it is time to build new walls and frame the doorway. We build a half wall where we will place the cabinets in the future. For lighting we want some can lights to light up just the counter space we are working at. After deciding on placement of lights we prepare the ceiling for installation of electrical boxes. After the electrician and plumber have everything installed where it is needed, it is time to call the inspectors to come give the go ahead to insulate. Once the insulation is in it’s time to get the sheet rock into place. This takes a lot of measuring and cutting. Then there is the taping and plastering and after that the texturing. It is time tacking but you can do it! 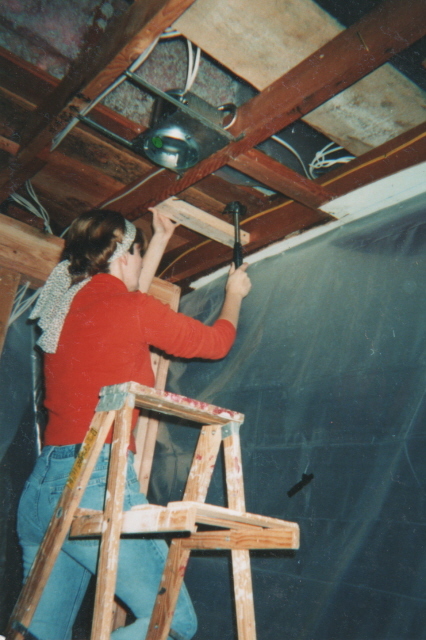 Remember to paint walls with a sheet rock primer-sealer before painting your wall color. This sealer is not the same as just primer. It will seal the sheet rock surface and the plastered surfaces so that they reflect the sunlight the same. Otherwise you may see your seams as the paint will reflect differently off of the two different kinds of surfaces. 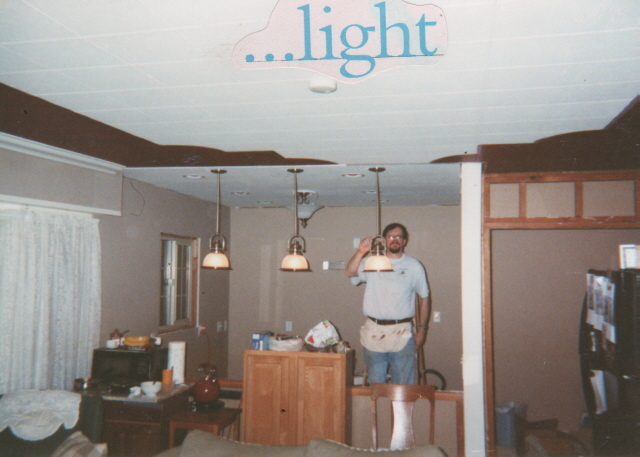 After painting your ceiling and walls, you finally get to do some of the fun stuff. Now you get to hang the light fixtures that you love. And everything just starts feeling pulled together. 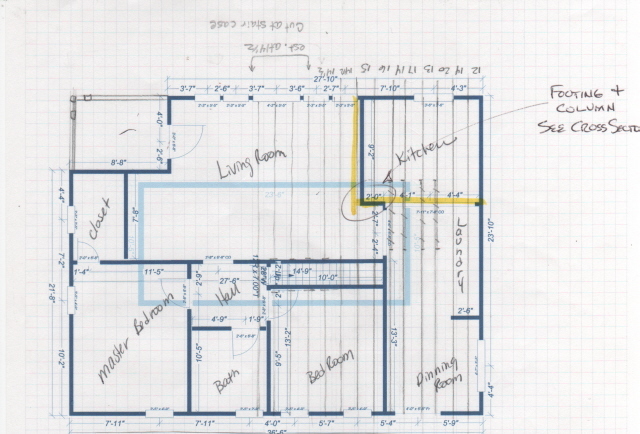 When starting a kitchen project make sure to plan out every detail. 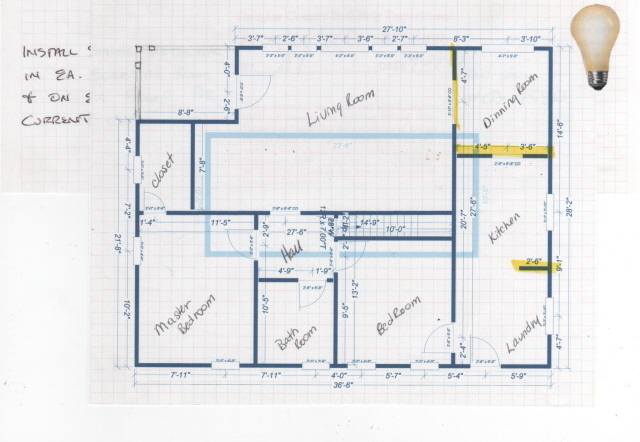 Here are our original house plans next to our new kitchen plan. The original was a galley style kitchen. 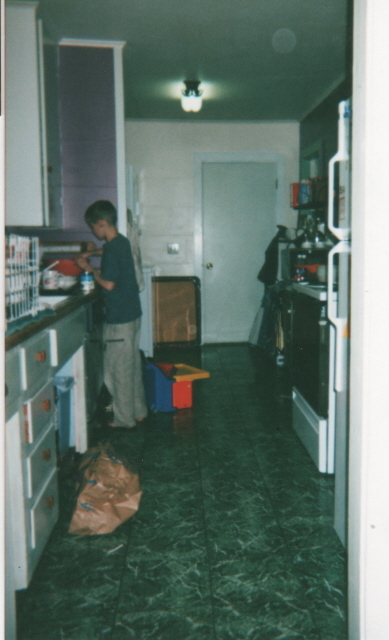 I hated my kitchen as it was dark and narrow and served as the hallway to the back yard. It was so narrow that I couldn’t open the oven and the dishwasher at the same time as they would hit each other. With little ones in the house I felt the need to yell out every time the oven was opened so no one would come running through and get burned. 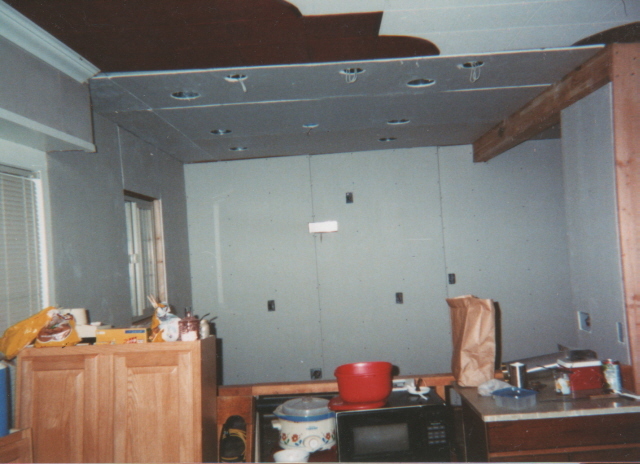 As we planned out my kitchen I was trapped into thinking inside the box. We had lived here for 20 years, and when you grow accustomed to things being where they are, it is hard to break away from that. So I called a contractor friend of ours who remodeled houses all the time. I asked him what he would do if it was his house. He suggested taking out a few walls and pushing into the living room with the cabinets. This was a bit scary for me as our living area was already small, but I trusted his opinion and set forth with making the plans. I am so glad I did. This is a view of the original kitchen. Despite the dark color on the walls this space was a dark space no matter what the color. I believe I tried a new color ever 2 years for 20 years and nothing looked good. The room had two windows but they looked out into the carport which was shaded also. The back door as you can see was a solid door, and was our way into my beautiful back yard from the house. So I decided that french doors should be included in our plans. This would mean moving the electrical meter from the back porch and making a larger opening for the doors. 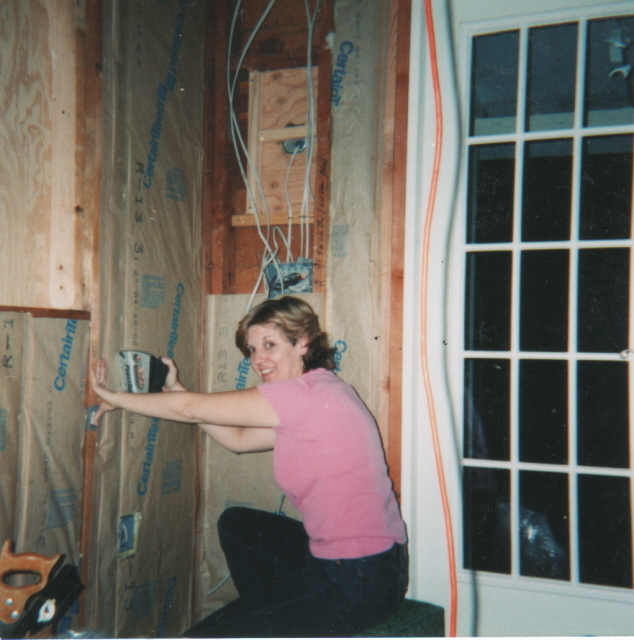 As we were remodeling the kitchen, dinning room and laundry all at the same time, we thought it would be the perfect time to rewire that side of the house. The wiring in the walls was very old and dry and there were not enough circuits to safely handle modern appliances. So we hired an electrician to come in and do the work. We had him move the breaker box to the front side of the house, rewire all outlets and install can lights and ceiling lights. Make sure to draw on your plans where you want your switches and ceiling lights. This will make it faster and easier for the electrician to get in and out and cut down on corrections later. Some outlets have to be placed in certain places depending on the building code in your area. So let them know where you would like special outlets near where you like to park your favorite end table, or night stand, or even where you plan on having your computer. I had double outlets put in by my sewing machines for extra power source where I needed it. 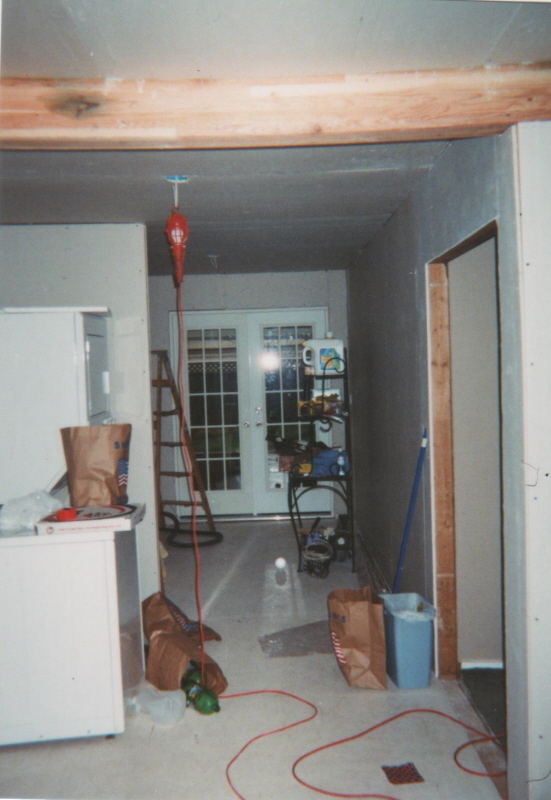 Any time you are planning on changing an exterior door opening to a larger opening you need to build a temporary wall about 6 feet back from the wall you will modify. This wall will support the weight from the roof while you work on the permanent wall. Once this temporary wall is in place you can start to cut the new opening. You will need to have aking and jack stud (or some call it the cripple stud) on either side of the opening space with a header board at the top. (To learn how to do any of the things I talk about in my blog Google it, or go to your local library and check out books on remodeling.) I have learned so much this way. With any door you will need someone on the inside and the outside to put shims into place. With French doors you may need a couple of people in each position to make sure they don’t go anywhere. Theses larger doors are difficult to get tweaked just right as there are two moving doors. This may be something you hire a professional for. You can have the door opening prepared ahead of time to save you money. The old laundry space is now the dinning room with a lovely view of the back yard and plenty of light. More on the kitchen project with my next post.